Halloween is the second largest commercial holiday in the United States, only behind Christmas. When you think about it, Halloween lovers tend to go all out for their beloved holiday. Great costumes, amazing decor, fun parties and tons of candy. 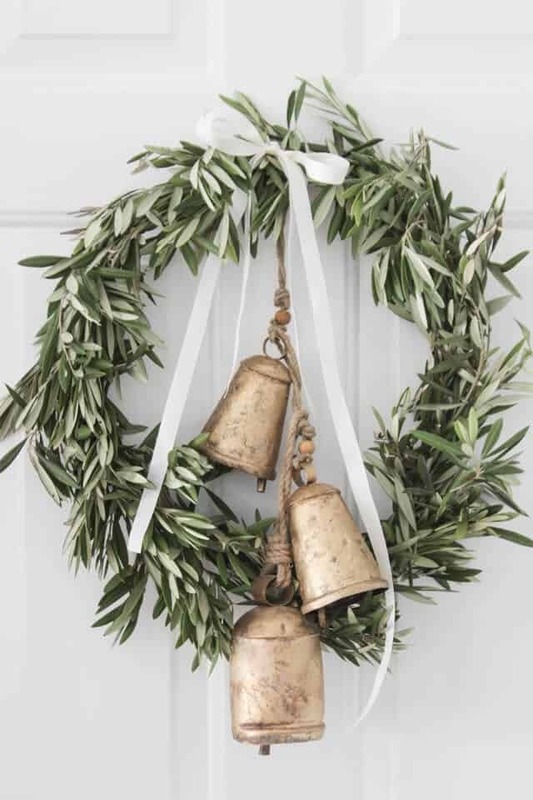 When it comes to decorating your home, a wreath is a must have. 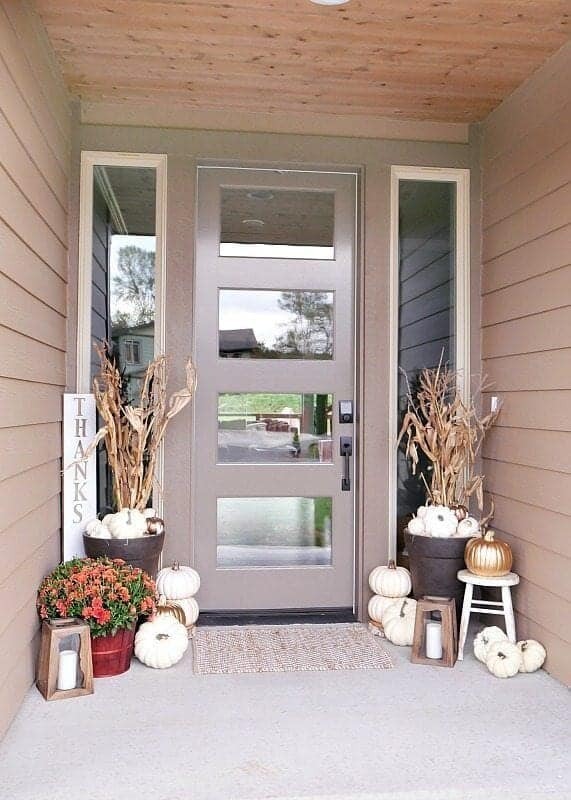 We love this collection of festive and just a little bit spooky ways you can decorate your front door. While the popular chevron print isn’t a typical pattern for Halloween, the use of the this fabric in orange and black makes it a perfect match. 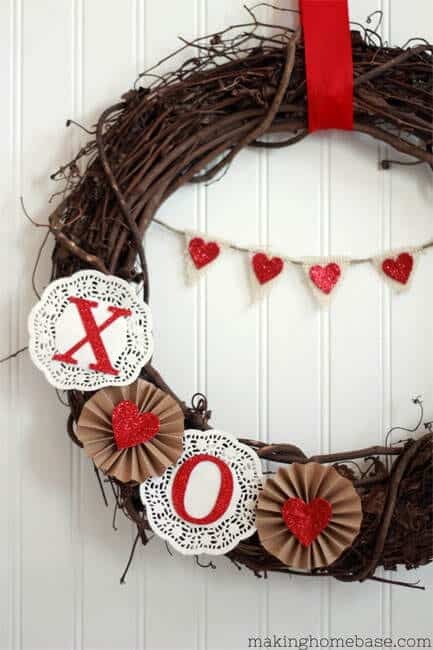 A straw or styrofoam wreath form is wrapped with either ribbon or fabric to get this look. 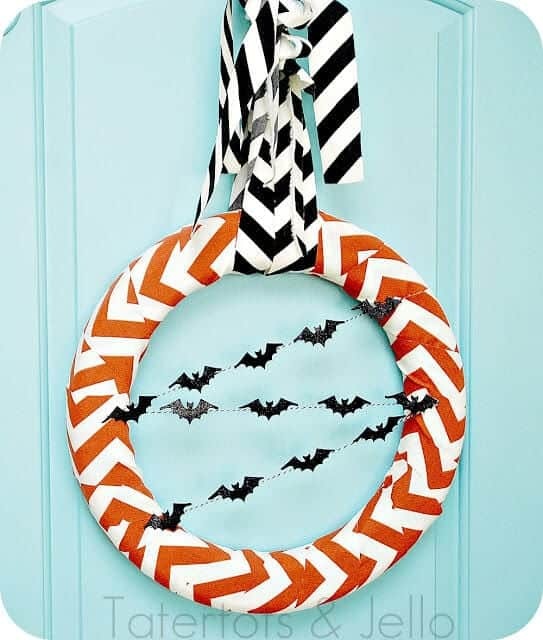 The simple yet creepy bat bunting really makes this a festive yet simple wreath. 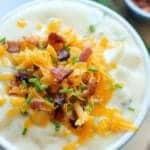 Nab this style from TaterTotsAndJello.com, along with tons of other craft and activity ideas! 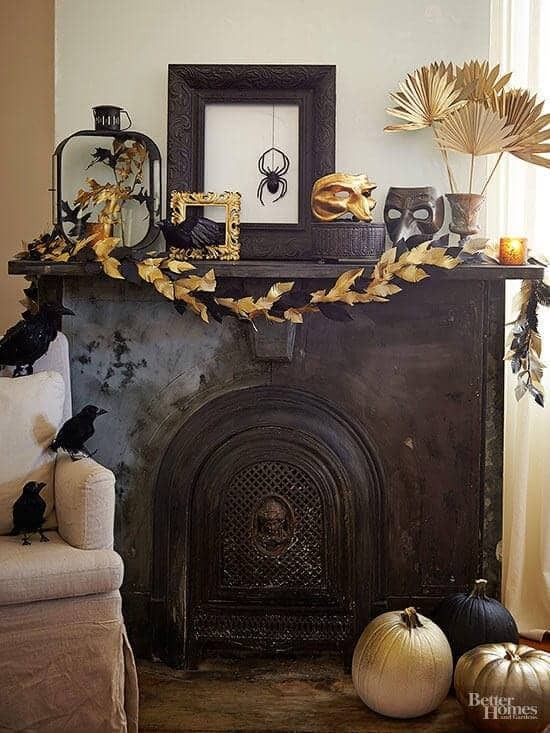 Using ornaments in non-traditional colors, this Halloween is perfectly spooky with it’s matte, shiny and glittery bulbs in blacks, oranges and purples. Tucked inside are coordinating leaves to give it that fall feel. And of course, center stage is a creepy spider! 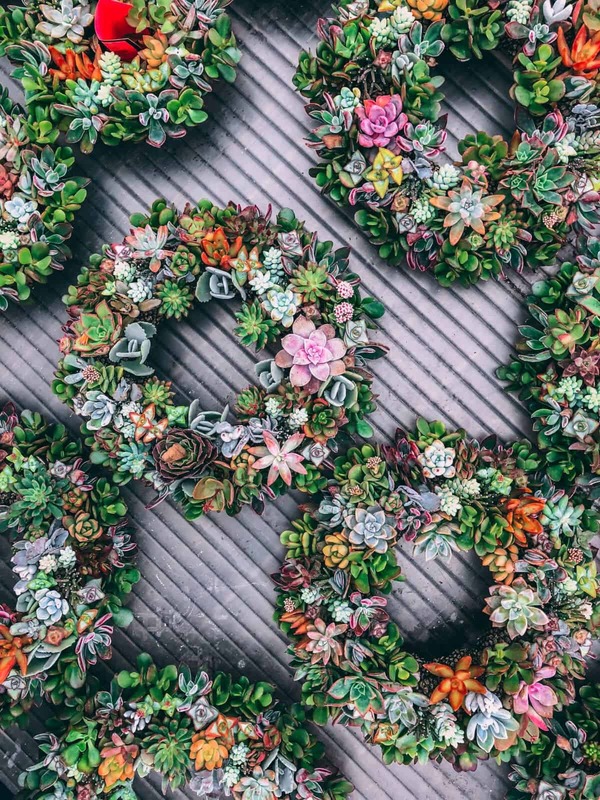 This is a wonderful wreath using a unique medium, that still manages to look classy. Head over to WhereTheSmilesHaveBeen.com to get a full tutorial on this wreath, as well as one for Christmas! This lace overlay covering a vibrant orange ribbon just screams witches, doesn’t it! I love the use of a great textured material, and the simple addition of a satin bow. 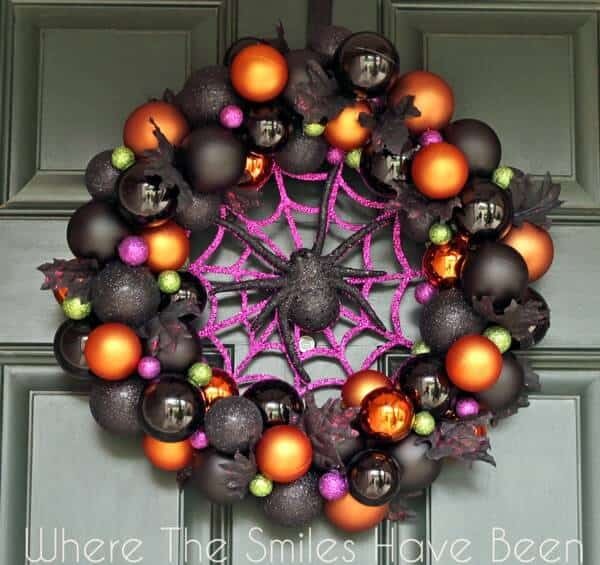 It is a delicate yet blatantly Halloween wreath that won’t give the kids the creeps. Visit Craftily-Ever-After.blogspot.com to see the full tutorial. You’ll also find tons of other crafty goodies! The candy of the season is always candy corn. 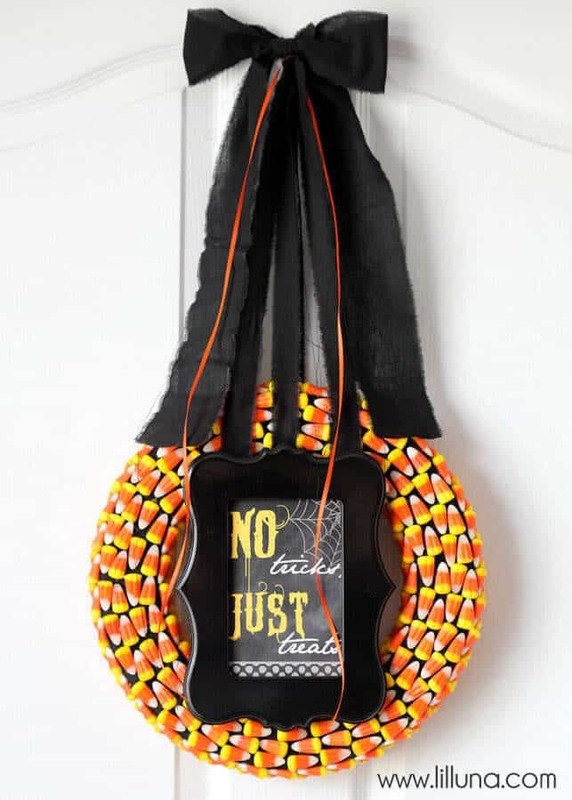 Even if you’re not a fan of the over the top taste, this candy corn wreath is the epitome of Halloween. 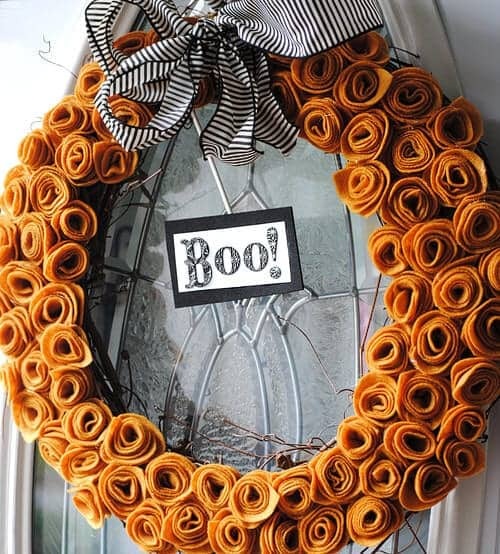 It’s a non-spooky wreath that’s sure to attract lots of attention from little ones. Just be sure to hang it high enough so little fingers don’t start poaching the candy! 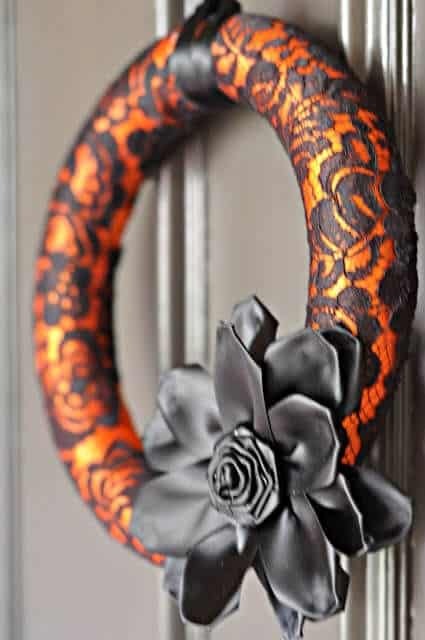 LilLuna.com has this wreath a great collection of over a dozen more Halloween wreaths! This wreath couldn’t get much easier or cheaper. Black burlap and some funky ribbon, in addition to an old wire hanger are all you need to make this happen. The rough edges of the burlap only add to the look and feel of this spooky holiday wreath. Check out ClassyClutter.net to see more on this wreath! 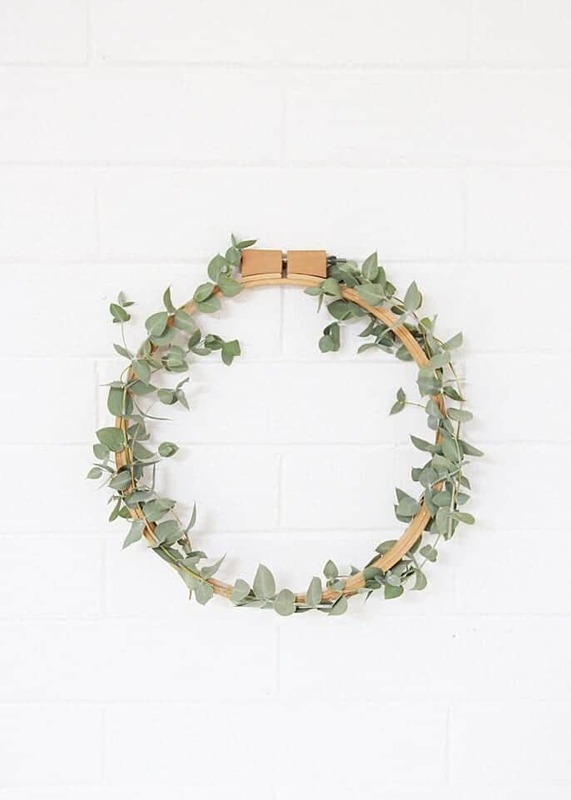 Using grapevine wreath forms will always help save you money, as they are very inexpensive. 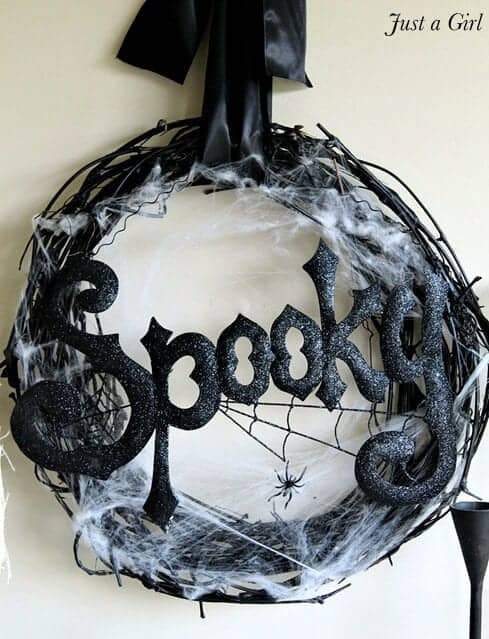 Some black spray paint, fake spiderwebs and itsy bitsy spiders fill out the remainder of this totally creepy wreath. 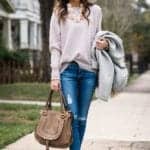 Get more tips on crafting over at JustAGirlBlog.com. 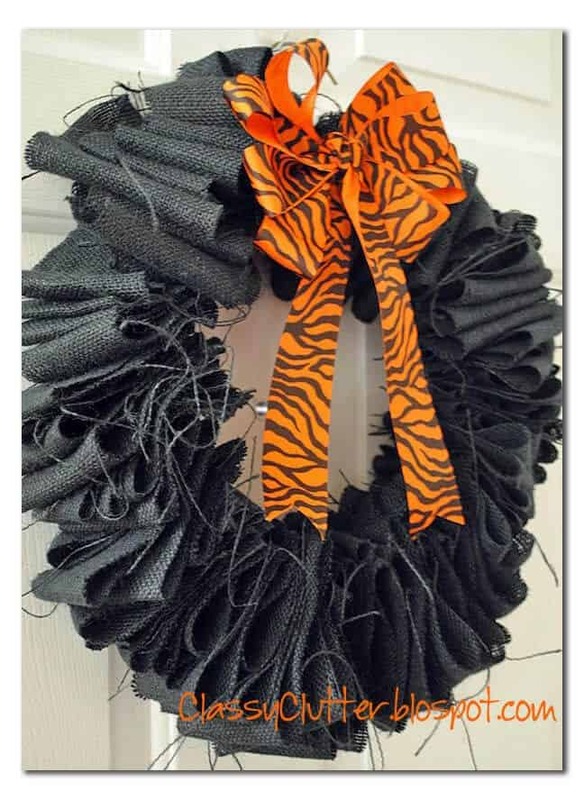 Edgar Allen Poe fans will clammer at the opportunity to make this wreath. The reminiscent design of his famed story, “The Raven” comes to life in this eery wreath. 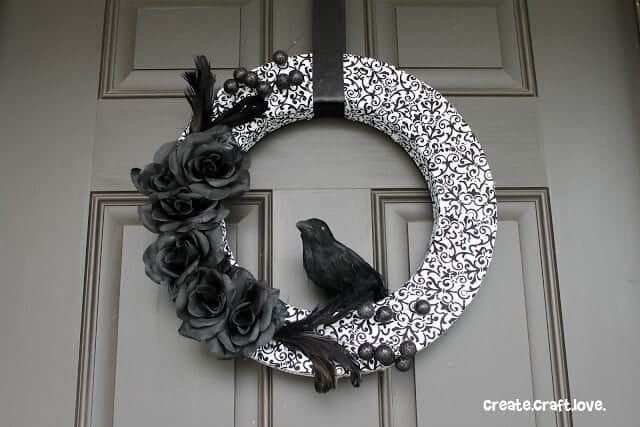 Dark flowers and a lone raven are the perfect pieces for this Halloween wreath. You’ll find the details on making your own Nevermore wreath over at CreateCraftLove.com. If you’ve got the patience to cut and roll a hundred felt flowers, then this wreath will be very rewarding to you. Handmade rosettes are added to a grapevine wreath and then finished off with striped ribbon and the cutest Boo sign you’ve ever seen. It’s Halloween themed, without being tacky or scary. 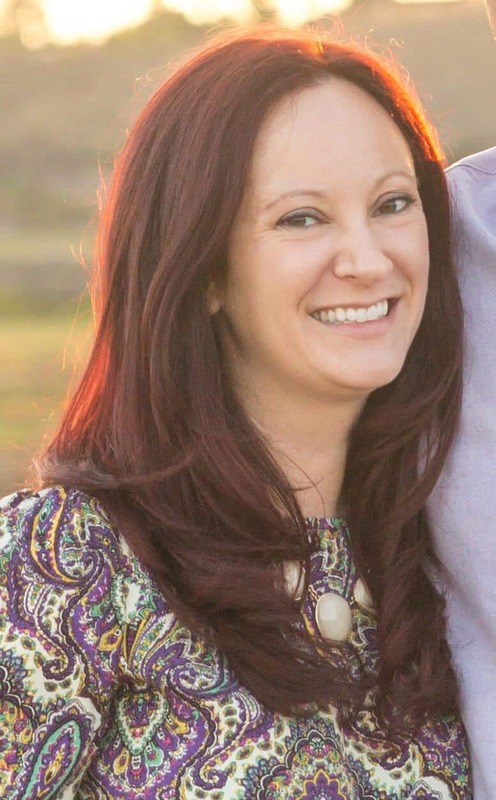 Head over to LivingLocurto.com for more goodies in the form of printables, recipes and crafts.